Twenty Totems: Ding! (60)... And so it Begins! Ding! (60)... And so it Begins! But even now, this has got to be the most fun I've had yet as a multiboxer. Let me tell you exactly what I did. First, we need to discuss the gear change that came with last year's expansion, The Burning Crusade. You see, when the expansion came out, we had previously spent nearly two years at 60, and to keep us interested, Blizzard had to keep adding more and more powerful level 60 gear. While we didn't ALL have this gear, they couldn't exactly release a new expansion, raise the level to 70, and add gear that wasn't as good as Tier 3 some players already had. So instead, the new gear had an enormous jump in "item level", making the new gear much more powerful than anything seen before the expansion. So when I hit level 58, I spent some time at Thottbot.com, and mapped out a series of quests that would completely gear my Shaman in identical TBC gear. My only fear, would be that I would level to 61 before I completed them all. And while I have one quest series left (to get bracers), I still have a few bubbles of xp left to pull it off. The only reason I haven't done the bracers yet, is because it's a REALLY annoying quest series called, Thick Hydra Scales. The short version is, Kill a billion Hydras that are widely spaced, until you collect 60 scales (12x5 Shaman). Ugh. But I'll get it done tomorrow, assuming it doesn't level me to 61. If I get too close, I'll bail. Why don't I want to go past 60? Well, that's because of the unique 51-60 Alterac Valley Bracket. All of the other battlegrounds push you into a new bracket at 60. (60-69) But AV is different, and AV is a multiboxer's paradise. So I mapped out all the quests, and got them done in 3 short gaming sessions. And sure enough, the xp was amazing, and it pushed me from 58 to 60 in no time. Of the quests, most were available at level 58, while the last 4 required me to hit 60 first. If you're going to do this, do yourself a favor and don't sleep in inns. The Rest XP will make it harder to complete them all without going over. With the new gear equipped, I headed into my first AV, and wasn't disappointed. I have NEVER had this much fun in WoW. I typically had a mob of 4-6 players who not only followed me around, but were thrilled to heal my boys and keep the Thunduh Rolling! I'll have some AV pics for you soon. The first few times I was in there I didn't even think to take shots. 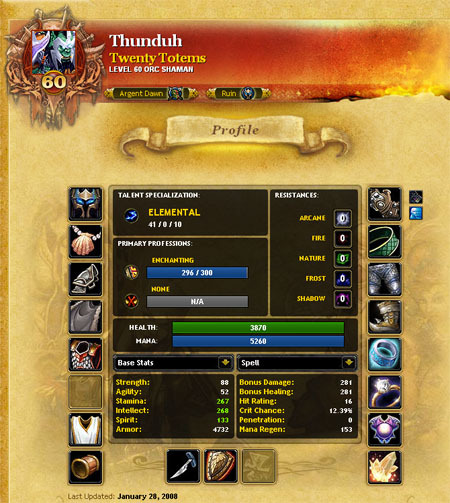 Part of my questing including aquiring two new trinkets, both of which have a "use" that boosts spellpower. Tomorrow I'll show you how I made a "Nuke" macro that allows me to stack up to 527+ spellpower, and cast a Chain Lightning of death, all with one press of a button.